A curse on the treasure! Brent's a remarkable look alike to ancient pirate. Allen Jaffe, Albert Salmi, and ? 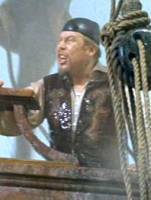 Captain Brent, who bears an uncanny resemblance to a certain 16th Century pirate, warns Nelson's divers not to go near any sunken pirate ships they might encounter while on a routine check of US undersea missiles. A Seaview diver soon runs afoul of Brent's warning and a missile explodes in its launch tube, killing the divers and shaking up the submarine. 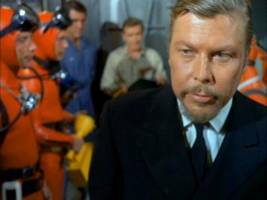 When the mini-sub is ordered out to look around, Brent waylays one of the assigned crewmen and takes his place. 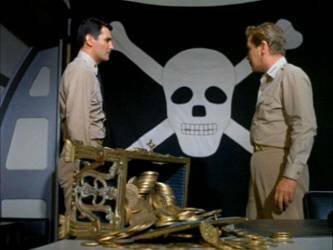 Morton soon finds the unconscious man, and later discovers a treasure chest and pirate flag in Brent's room. It becomes apparent that Brent has commandeered the mini-sub -- but to what end? A report from high command is received confirming that Captain Brent's credentials are impeccable except for the fact that he's got a pirate back there in his ancestry. A sudden explosion signals the destruction of the purloined mini-sub and allows sensor operator Kowalski to trace its last location to a nearby island. It's an old pirate's haunt where, it turns out, Brent commands a base from which he has tapped into the American missiles, in effect, pirating them. 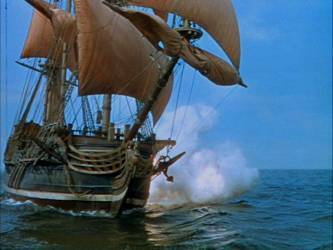 Crane heads out with Kowalski in the Flying Sub to chase him down, but they're soon brought down by a broadside of cannon fire from what appears to be an ancient pirate ship. Kowalski works on repairing FS-1 while Crane scubas over to the island in order to be caught by (arghh!) Captain Brent. Kowalski fixes the Flying Sub, returns to Seaview for Nelson, and the two head back to the island to fetch their captain who has in the meantime gotten free. Before the last reel unspools, Brent's secret base is burning and "the boys" have escaped from the "curse" of Captain Brent. Nelson & Crane discover damning evidence in Brent's cabin. 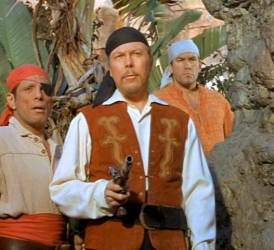 Mark Says: Wonderful stock footage of pirates fighting, and a great fade-out on Albert Salmi for the teaser, promise some thrills but the episode is neither supernatural nor a straight-forward tale of modern-day pirates (which could have made for a good dramatic story). Instead, it�s over-the-top antics by Salmi and his crew, which compromises any danger. Mike Says: Mark pretty-much says it all. The mixing of pirate fairy-tail and modern-day science doesn't work, at least not for me.